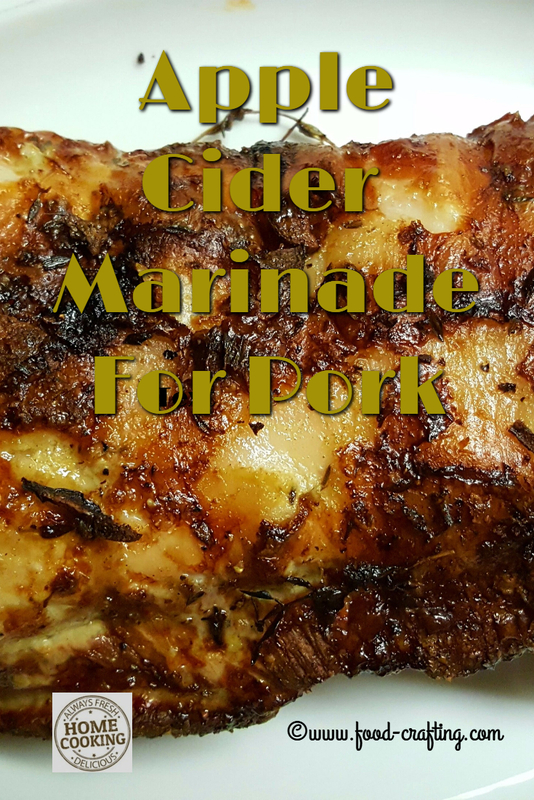 Apple Cider Vinegar Marinades – Without a doubt, this is the best apple cider marinade for pork loin. It’s just as good as a vinegar chicken marinade! In a hurry? Pin the recipe to keep it handy. Not So Secret Ingredients In The Apple Cider Vinegar Marinades? Lots of Garlic! I know the original version of this apple cider vinegar marinade worked wonders on grilled chicken. I’ve been waiting for the perfect opportunity to try it on pork – in a seriously doctored up version. 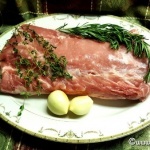 It is close to the best marinade for pork tenderloin or any pork loin roast. Elephant Garlic, 3 Huge Bulbs! Great for Planting, Eating or Cooking! Non GMO, Organic. Milder Tasting Garlic Let’s hope nobody is afraid of garlic because there is enough garlic in this concoction to banish vampires forever. Two cloves never hurt anyone but did you notice the size of those cloves? During the summer last year, I noticed that fresh garlic sold in supermarkets seemed to be dried out or mildewy and far from the pungent recipe garden fresh ingredient of yesteryears. 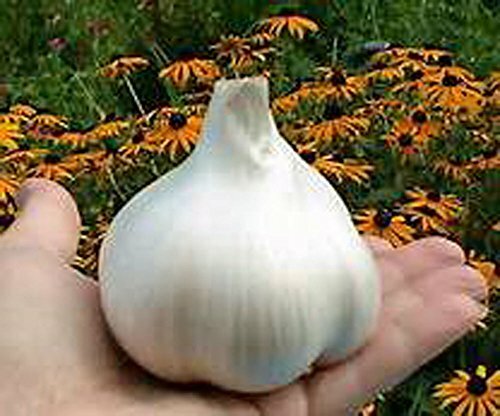 The best and freshest garlic needs to be hard to the touch, with a purple tint to the papery skin, without a hint of moldy residue on it and it should, above all, smell like garlic. It didn’t and the recipes always seemed to lack the required kick garlic imparts in Italian and Spanish recipes for example. The turning point came when a bowl full of escargot butter failed to make the grade. One day, instead of taking the time to root through a pile of garlic bulbs to find a good one, I reached for one of those giant bulbs. Not only did it smell fabulous but as soon as I removed the easy to peel skin, the aroma clung to my fingers. Perfect! Elephant garlic is my new favorite ingredient for 2017 – that and truffle salt . 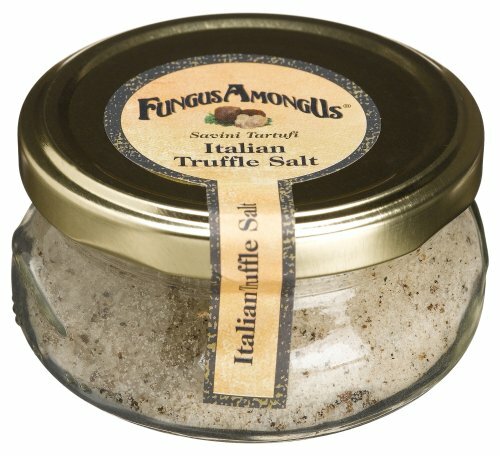 Go very easy on the truffle salt. Don’t use it to literally season your roast or casserole – think of it as the tasty pinch of “je ne sais qoui” that ties recipe ingredients together. Watch the eyes of your dinner guests open wide as they try to figure what you added to the recipe! More Apple Cider Vinegar Recipes! When it comes to making a quick sauce or marinade, no kitchen tool is handier than an immersion blender. My Viking Pro is now discontinued but if I ever have to find another it will a toss up between this KitchenAid model and a Braun® model . It has to have power. Buy the best, most powerful hand blender you can afford. I love the fact that I can whip and/or blend my marinades in a container designer to get the most out of the blade action. It’s perfect for vinaigrette and other salad dressings. My blender has two speeds – handy when you just want to blend well rather whip up a storm. 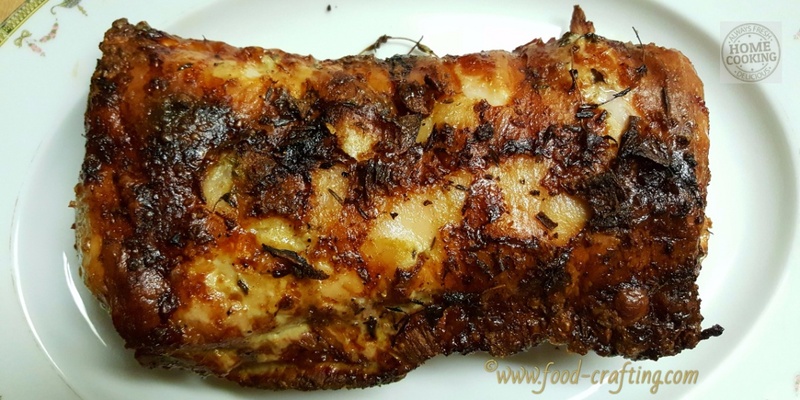 Tangy and juicy roast pork loin marinated in a rich blend of herbs, spices and beaucoup de garlic. 1 large clove of elephant garlic, to add to marinade then top the roast. Celery, cut in 1 inch pieces to equal 1 1/2 c.
Prepare the marinade, place pork roast in a large freezer strength plastic bag and pour marinade over the meat. Distribute the liquid and herbs evenly then seal the bag tightly. 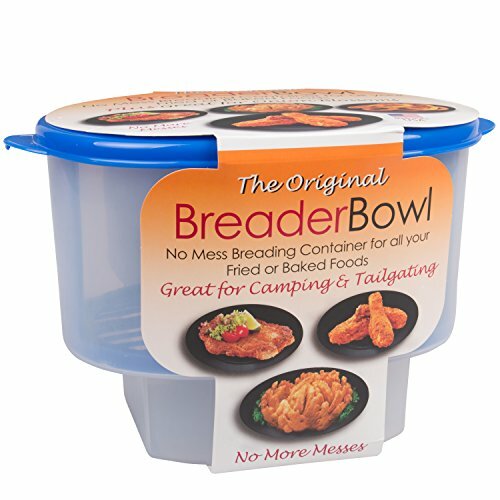 Place in a large bowl to allow entire piece of meat to rest flat. Flip the bag every couple hours. There is not set time but allow to marinate at least 8 hour up to 24 hours. In a bowl, place the baby carrots, celery pieces, onion chunks and herbs. Toss to mix well. Spread evenly across the bottom of a large roasting pan. Remove the roast from the marinade and allow excess marinade to drip off. Place on top of the cut vegetables and top with any sliced pieces of garlic remaining in the marinade. Lower oven to 350 degrees and roast for another 1 1/2 hours or until done to your preference. Every 20 minutes or so, baste with reserved marinade. Serve with steamed or roasted baby potatoes or a risotto. As you can see in the photos, I stripped some of the thyme and rosemary and left whole sprigs of the fresh herbs as well. I was in a hurry. 🙂 I would advise taking a couple extra minutes to strip the fresh herbs to remove the stems. You may want to season the vegetables lightly but there is no need to add seasonings to the pork before cooking it. It has, in effect, been brined by the marinade. USA guidelines now allow for a lower internal temperature for cooked pork. The meat stays nice and juicy, more like a medium rare cut of meat. While some people like their pork well cooked, I prefer it still slightly pink. Please adjust the timing to your preferred level of “done”. 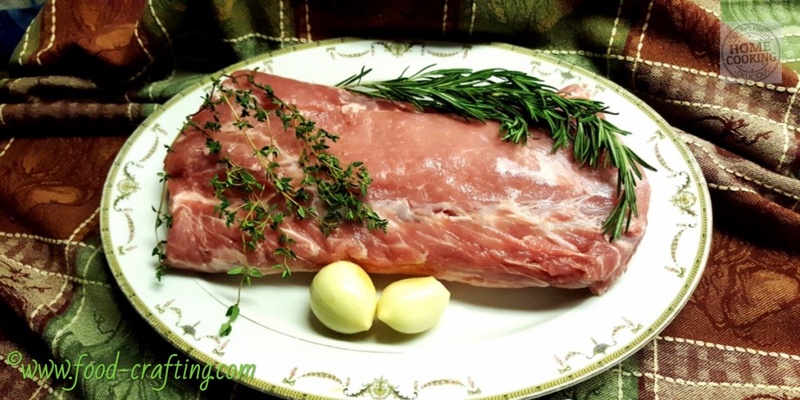 How healthy is boneless pork loin? As healthy and lean as a piece of skinless chicken. There is a reason why it’s called “the other white meat”. And… we all know that apple cider vinegar is good for you! 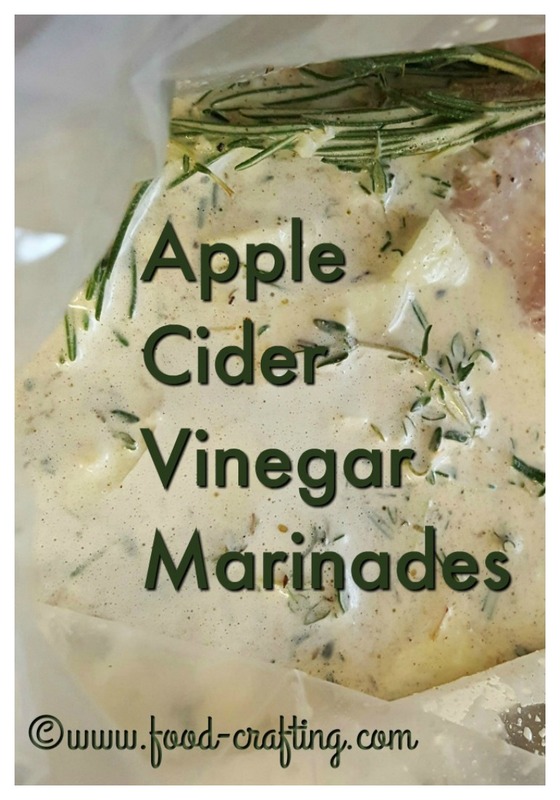 So give this and other apple cider vinegar based marinades a try. You can make your meats extra juicy by injecting marinades directly into the meat. Some of the meat and poultry marinaters used for this purpose are a little too “doctor like” for me to keep in the kitchen so I prefer doing it the old fashioned way. I find it works just as well. On the other hand, this little gadget is going to find a home in one of my kitchen drawers! 1 Not So Secret Ingredients In The Apple Cider Vinegar Marinades? Lots of Garlic!